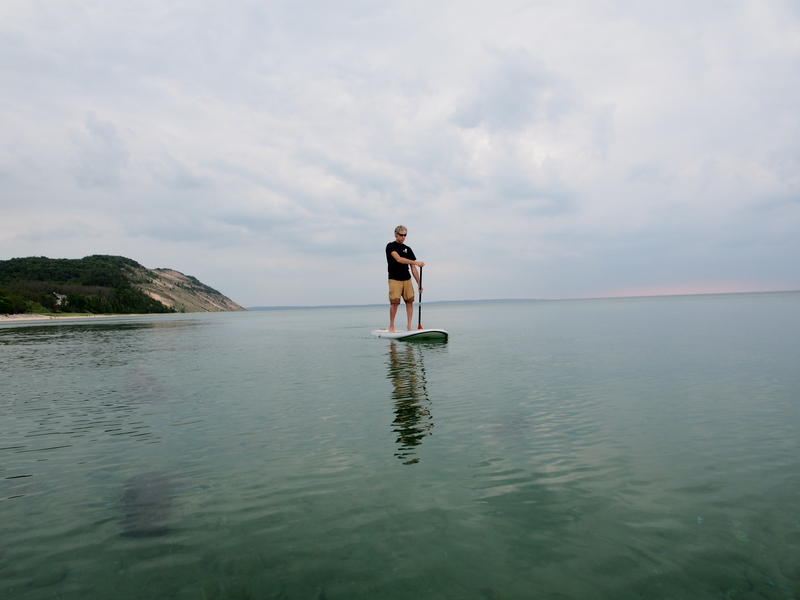 Take a SUP onto beautiful Lake Michigan. Rent one and see the Sleeping Bears Dunes with new perspective. Get your feet wet with Sleeping Bear Surf & Kayak ~ Northern Michigan’s 1st freshwater surf shop! When we started renting and selling Stand-up Paddbleboards in 2005 everyone was intimidated by the oversized surfboards. Stand-up Paddleboarding Northern Michigan has taken off and is Stand-up Paddleboarding is the fastest growing sport in the nation! Our large inventory of C4 and NSP Stand-Up Paddle Board rentals are the perfect way to view the lakeshore and the beautiful, clear waters of Lake Michigan. It is an ideal way to perfect your experience ‘Up North’. 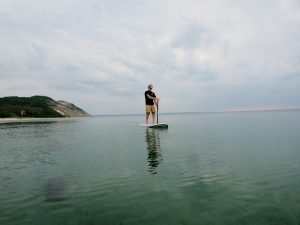 Not only can you see the Empire Bluff, the Sleeping Bear Dune and the vast lakeshore in between, but stand-up paddleboarding allows you to see everything beneath you as well! Try stand-up paddleboarding worry free. There are no sharks, dangerous creatures, salt, coral or large rock masses to create anxiety during your peaceful paddle. Remember, Lake Michigan is located next to South Bar Lake, a beautiful, calm inland lake with an incredible ecosystem. You don’t have to limit yourself to calm water either! Try going out in the waves with our all-around boards. Catch some waves on your knees or feet! Surfing on a stand-up paddleboard is over the top fun too! When renting a SUP, we will give you a 10-15min overview of how to use and care for the board, paddle and other equipment. As well as certain tips and techniques when paddling and surfing the board. For boards going to the Empire beach, we recommend and appreciate it if you take advantage of the simple carts we supply and walk the boards to the beach (we are located a mere block away) or strap them on top of your vehicle if you plan on driving down from town. We are also happy to drop them off for you if necessary.